Lately, everything just seems to be off. I don’t know what’s up. The weather, my health, my oven – it’s all topsy-turvy and backwards. I hope it rights itself soon because I don’t know how much longer I can take it, especially with this nasty cold. A steady intake of Robitussin and Sudafed does not a proper meal make. This weekend I decided to make something cheer me up, yet it only served to frustrate me even further. My oven, the ancient Cadillac stalwart of my kitchen, has decided to get persnickety on me too. Welcome to February. Before I do the deep dive into my annual Month of Chocolate, I decided to tackle something that is not only perfect for Valentine’s Day but has been a bit of a challenge for me: Pavlova. I’ve always had trouble making meringues at home. Something about my oven, that ‘ol Bessie, just doesn’t agree with the technique. The temperatures are off and the poor thing just don’t go nearly low enough. I can crank out perfectly angelic white meringues at work in a professional oven, but at home? No dice. So despite my foggy head and uncontrollable sneezing, I decided to take another crack at Pavlova, my personal demon. The Sudafed must have interfered with my sense of reason. Pavlova is the national dessert of New Zealand. Or Australia – there is some debate about this. Regardless, it’s a meringue base with whipped cream and fruit, usually kiwi, and is delicious. The key is the texture; it’s crunchy on the outside but soft and almost marshmallowy in the center. I checked in with my friend/mentor/boss Gale Gand, the Pavlova queen for some advice. We’ve made Pavlova frequently for events and demos with no issues, so I asked, what was my problem? Inconsistent oven temperature it turns out. The meringue needs to set and then slowly dry in a very low oven to achieve the proper texture. Then she gave me the permission I needed: it was OK to stray from perfectly white fluffy pillows. She usually bakes hers to a light café au lait color so pristine white, which I have such difficulty achieving at home, isn’t necessary. Thank god. Failing that, she recommended folding in some cocoa powder and calling it chocolate. Brilliant. That was all I needed – the permission to quit obsessing about stark white meringues. I started with Gale’s recipe but adjusted the method slightly to work with my testy oven and made individual pavlova’s rather than a single large one. They turned out pretty well and I’ve finally conquered this one. Check. 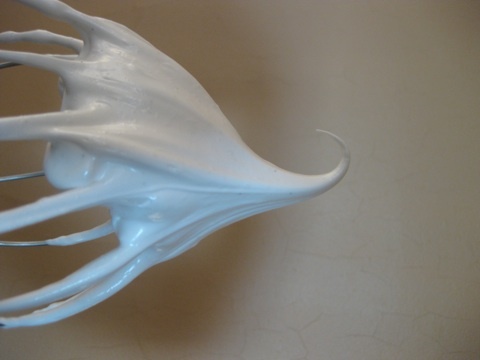 Whip the egg whites to soft peak – or what I like to call the “dairy queen” test. Whip to the point where the whites are stiff, glossy and when you pull the whisk out of the bowl, it peaks and bends slightly, like the top of a Dairy Queen ice cream cone. If it points straight up, the whites are slightly overwhipped. Not the end of the world but just a little less next time. If the whites look like big chunky pieces of styrofoam, then they are most definitely overwhippped and there’s not much you can do at that point. The baking part is the most important – make sure you have an oven thermometer to check the temperature. Most ovens are off at least 15°F. Mine, for whatever reason seems to fluctuate up to 40 degrees. It’s annoying but at least I know what I’m dealing with. Bake for a few minutes at the higher temperature to set the meringue, then lower the temperature to dry slowly for about 45 minutes. They’re delicate, be gentle. Then – and this is important – turn the oven off, prop the door open with a towel or pot holder to vent some of the heat and leave them in there for ½ hour to continue to dry. What you should end up with is a crunchy meringue that’s ever so slightly chewy in the center. If it’s not too humid you can make these a day ahead, just keep very tightly wrapped. Now then, remember that passionfruit curd from earlier in the week? Now’s the time to use it. A fruit curd isn’t traditional but I like the layer of flavor and contrast it adds, especially something tart like passionfruit. A thin layer on the meringue, topped with lightly sweetened whipped cream and some fresh fruit or berries. I had some blackberries that were looking a little tired so I tossed them with some sugar and a shot of crème de cassis. As I mentioned, fresh fruit particularly sliced kiwi is traditional so use what you like or have on hand. If, for some reason, your meringues are overbaked and too dry, no worries. 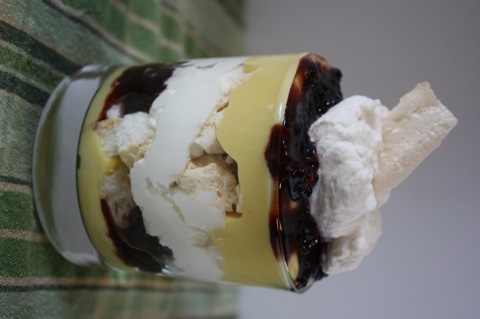 Simply make a parfait layering the crumbled meringue pieces, passionfruit curd, whipped cream and berries. The meringue will soften nicely and there will be interesting layers of textures and flavors. STRESS BAKING THERAPY FACTOR: SERIOUSLY GOOD. Any dessert that’s named after a ballet dancer – Anna Pavlova – holds instant fascination for me. Meringues are tricky – get them right and it’s a personal triumph. This is a dessert you don’t see that often, if ever really, so try it out. With the passionfruit it’s perfect for Valentines Day and is a lovely light finish to a heavy dinner. Serves 4 – The recipe can be easily doubled to make 8 individual or one large 9” pavlova. 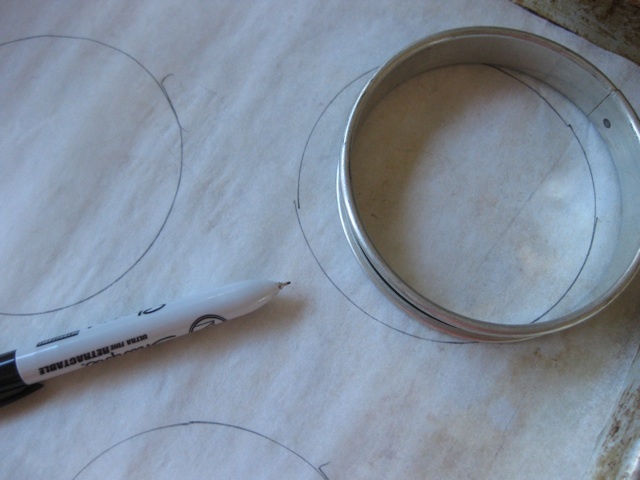 On a sheet of parchment paper cut to fit a sheet pan, draw or trace four 4” circles. Flip the paper, pencil side down on the sheet pan and set aside until needed. In a mixer fitted with the whisk attachment, whip the egg whites, cream of tartar, and salt in a clean, dry bowl on medium-high speed until foamy. Add the sugar, cornstarch, vanilla, and vinegar and continue whipping until stiff, smooth, and glossy, about 8 minutes more. When you pull the whisk out of the bowl, the whites should peak and flop ever so slighty at the tip – the “Dairy Queen” test. Spoon the egg whites into the traced circles, using the back of the spoon to smooth the top and sides and create a slight divot in the center. Bake for 8 minutes in the center of the oven. Reduce the heat to 250°F and continue to bake about 40 additional minutes until the meringue has puffed, cracked slightly and the surface is lightly browned to a light café au lait shade. Turn off the oven, prop the oven door open with a kitchen towel, and let the meringues cool in the oven at least 30 minutes, to room temperature. This ensures a gradual cooling. Whip the cream: Whip the cream, powdered sugar and vanilla to soft peak. 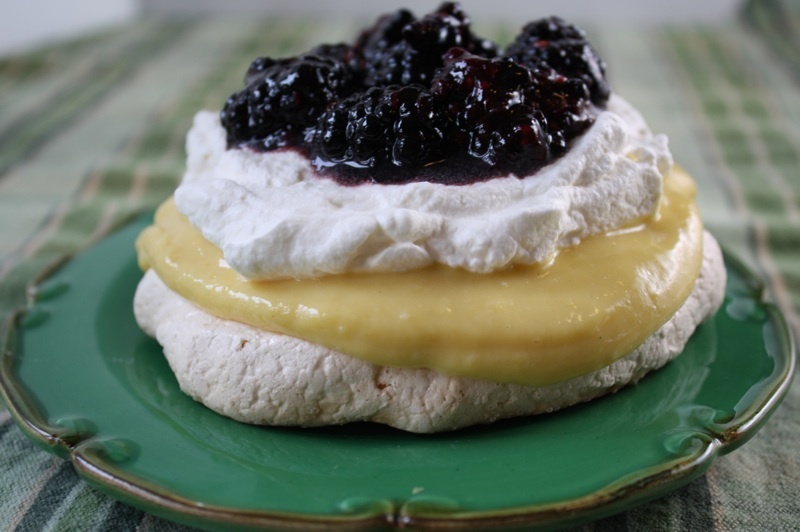 To serve: place a meringue disk on a plate, top with ¼ of the passionfruit curd (about 1/3 cup), top with whipped cream making sure the edges of the passionfruit curd are visible, sprinkle with a few blackberries. Serve within ½ hour as the meringue will begin to soften up and lose some crispness. Whether or not it was perfect when you made the pavlova I had, I must say that it was absolutely delicious! I’m still thinking about how yummy it was.